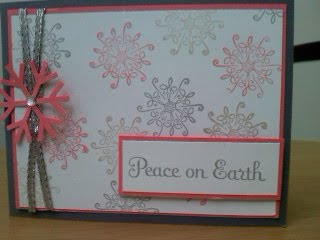 My challenge.. use Coral CS & Ink.. my daughters challenge... on a Christmas card! I mixed the Coral with light grey and silver... and I love it! I wasn't sure about it at first, but it adds come elegance to the fact that its a christmas card. As a matter of fact, it screams out to me to be the card I am giving my grandmother! I was beginning to think my daughter just wanted me out in the craft cave so her and her brother wouldn't be bothered! They are like that I am finding out.. distract mom so she doesn't see .. A B or C.. LOL.. they are teens so I guess it goes with the age! This second card - I had to let the ribbon dry since I used the coral ink and inked up the ribbon - so as easy as this card looks it was just a smidgen longer to make since I did the ribbon. Again, happy with the coral color. 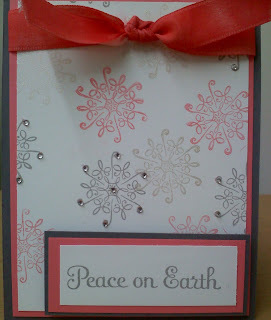 For depth, I added rhinestones to a few of the snowflakes. IRL they are shinier. Thank you for stopping by. Leave me a comment and tell me what you think of this color combo.